Santa Cruz community members press against the windows outside the packed City Council meeting, craning to see the proceedings. Photo by Lluvia Moreno. 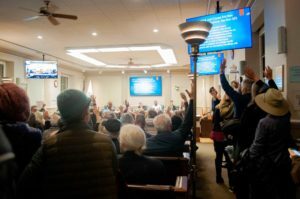 From the gallery, the windows and a screen in the nearby Tony Hill room, onlookers witnessed City Council vote to establish an interim just cause eviction ordinance and finalize a renter relocation assistance ordinance. 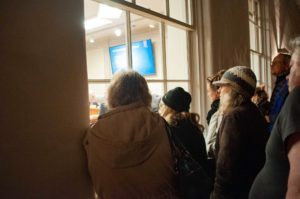 The first meeting of the new City Council on Jan. 8 drew the residents of Santa Cruz out in force, filling council chambers beyond capacity and extending past midnight. The interim just cause eviction ordinance is intended as a Band-Aid solution while the community deliberates on how to fairly balance the interests of renters and landlords after Measure M, the rent control measure on the November 2018 ballot, failed. That conversation will take place through mediated discussions between representatives of the Santa Cruz community and a community-nominated task force. The ordinance expires one year after implementation or upon implementation of the community recommendations. Public comment demonstrated a clear division in opinions over just cause eviction. The dialogue spanned three hours. Nearly everyone raised their hands when asked who wanted to participate in the public comment portion of the meeting. Photo by Lluvia Moreno. Supporters of the interim ordinance insisted it was necessary to ensure tenants were secure in their housing during community deliberation. Landlords protested that the council’s vote in favor of the interim ordinance would be tantamount to instituting Measure M over the will of the voters. Comments from opponents of the ordinance revealed confusion and misinformation over which elements of Measure M the council was going to vote on. Though there are some minor differences, the interim just cause eviction ordinance is nearly identical to the provisions of the February 2018 rent freeze. Like last year’s emergency ordinance, a landlord may only issue a notice of eviction on certain grounds. These grounds include failure to pay rent, breach of a material term of a rental agreement, damage to the interior or exterior of the property and in cases of conduct so disorderly as to constitute a violation of state or federal law. Unlike the rent freeze, this ordinance was not passed as an emergency measure, and will require a second reading at later council meetings before implementation. It also exempts both landlords living on-site with their tenants and landlords leasing their primary residence with the intention of moving back onto the property in one year. Near midnight, the council moved on to the final reading of the Relocation Assistance For Displaced Tenants Ordinance, first introduced in July 2018 at a City Council meeting. Under this ordinance, the tenant is eligible to receive two months’ rent worth of relocation assistance if they leave the home they rent under certain conditions. Namely, if the tenant leaves within 60 days of a rent increase of more than five percent in one year, or seven percent over two consecutive years. Many landlords who spoke during the public comment portion of the Dec. 11 City Council meeting adamantly opposed the new ordinance. Tenants’ rights and housing activists disagree. Those affiliated with Measure M and SUR are angry about the lack of action taken to protect renters while they are tenants, not just after they are evicted. Julian Parayno-Stoll, co-chair of the Santa Cruz chapter of Democratic Socialists of America and SUR member, has been vocal about his concerns with the relocation assistance ordinance. By the time the new City Council adjourned its first session, night began to creep into morning and the bustling mass of residents in the gallery dwindled to a dedicated few. Slowly, they trudged through the double doors and off into the dark. The next reading of the interim just cause eviction ordinance is slated for the Jan. 22 council meeting.